These photographs were scanned from my Dad’s Mothers album which are in the “Head” archive, of which I have guardianship over. Some quite interesting early lightweight machines can be seen. It looks as if Dad had use of both pre war and post war Raleigh Record Aces during this period. Dad was a member of the Woolton Wheelers at this time. This album catches some faces and machines at this time. Above: Nice ride up the Winnats Pass, near Castleton. Looks as if its at the top! Above: Dad at the top of Shrewsbury Monument, Dad on left. Above: This photo is on an outing to Alderley Edge, Cheshire. As a family we go here regularly now. Above: At Grindleford. This is in the Peak District. 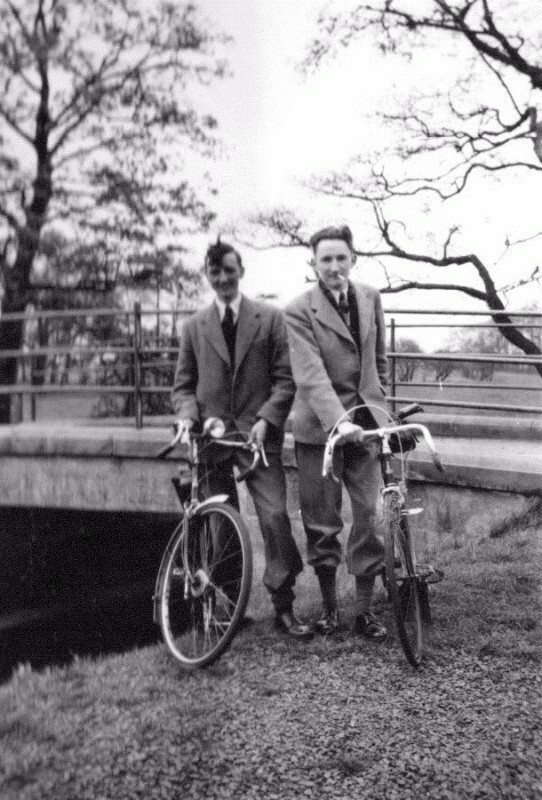 Dad went on a cycle tour with his brother Charles. He went to many places including Tarr Stepps, Holsworthy, Lynton, Lymouth, Combe Martin and also Bath, something he referred to as “Head Hallowed Ground”. The Head family originated from Bath. It looks as if he was riding his post war Raleigh Record Ace for this tour. 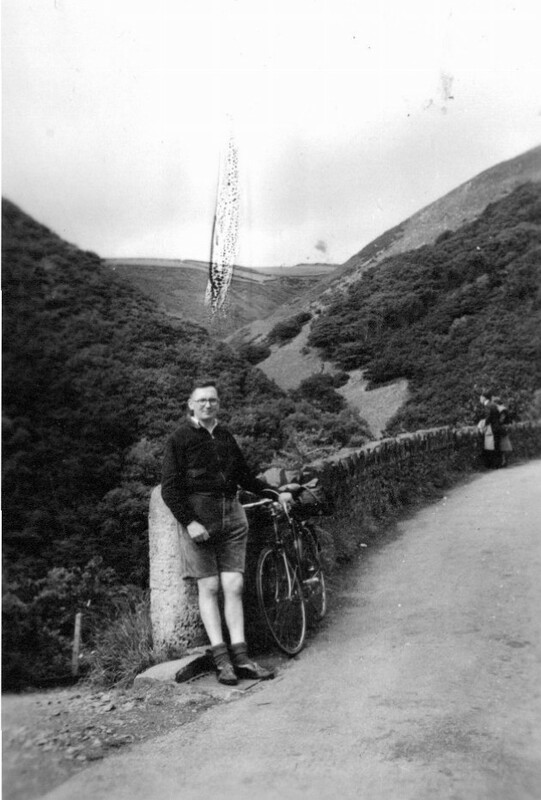 Above: Dad appears to be on his post war Raleigh Record Ace. Location unknown. Above: On his post war Raleigh Record Ace. Note his twin drinks container and Raleigh Record Ace lamp bracket on the left hand fork. It was common practice then for clubmen to fasten their front light to the left hand fork blade in order to better direct the light down to the edge of the road. Before I learned this I thought this was odd at first as there is a pip on the right hand fork for a RRA cycle lamp holder. However it was clear from paint scratches on the left hand fork that a lamp bracket had been present. In a box of parts I found both right and left handed RRA lamp holders. I have had both re chromed on my restoration. Location unknown. Above: His brother Charles. Location unknown. A few pictures of Dad. 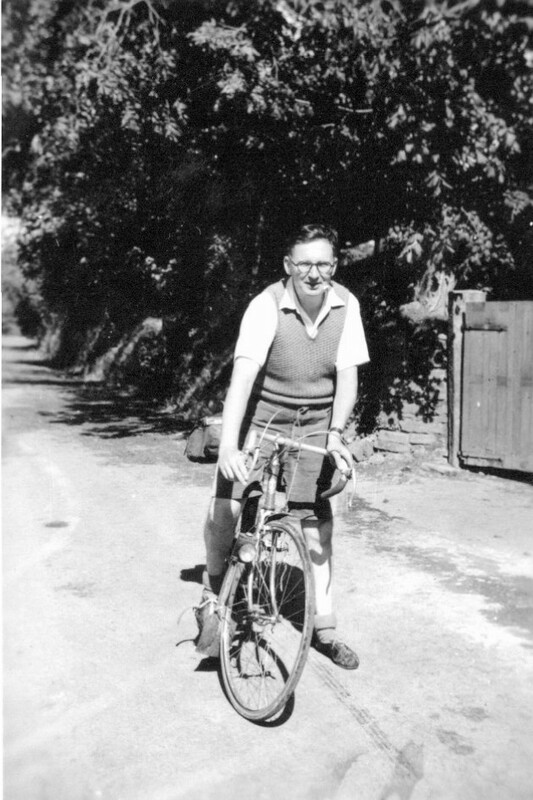 He went on a cycle tour before his National Service in 1948 which he spent in Palastine. This gave him a life long passion for Egyptology which he shared with us as children. 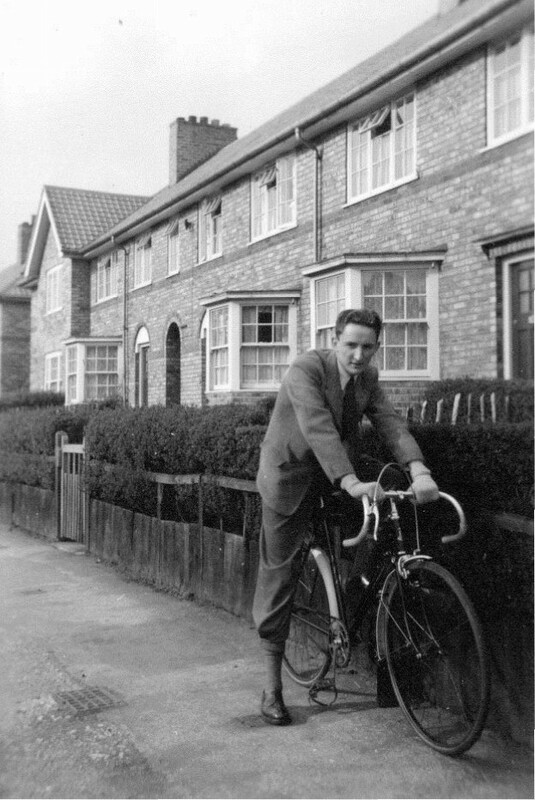 Another picture is outside his home in Redington Road, Allerton, Liverpool in 1951- the other with his life long friend, Brian Broughton, in the same year. Above: Charles and Kathleen. 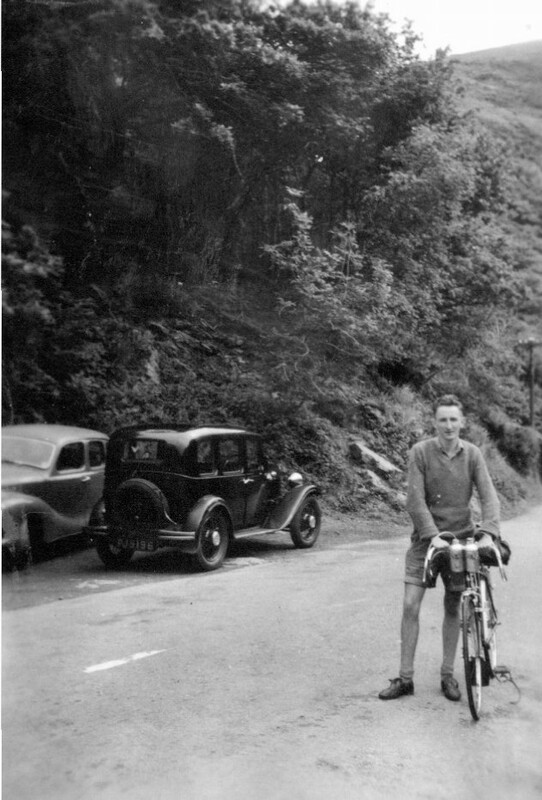 Dads pre National Service tour 1948. Dad went to Palestine which gave him a life long passion for Egyptology. This he shared with us as children by taking us to the exhibition of King Tutankhamen artifacts at the British Museum in 1972. Something I remember to this day. Above: Outside his home in 47 Redington Road, Allerton, Liverpool. 1951. 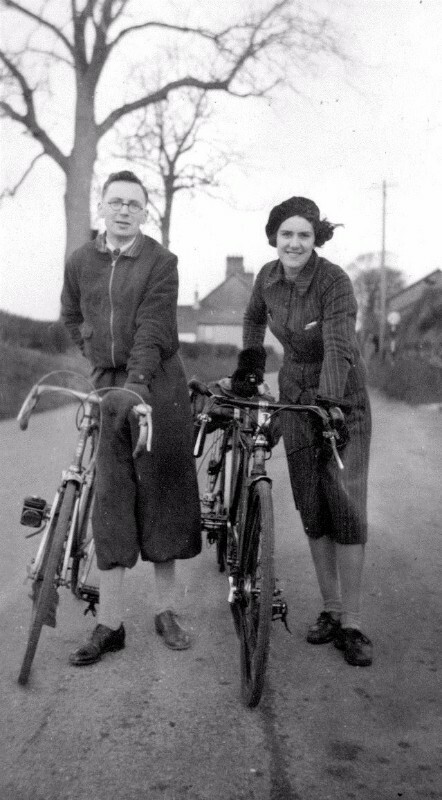 He appears to be on his pre war Raleigh Record Ace. He is riding this cycle either fixed wheel or single speed. Using only one front brake it appears to be set up for club work (although this was default standard for the pre war RRA). He is dressed, however in his best bib and tucker! Looking at Google maps you can see EXACTLY where this photograph was taken. His foot is on a utility cover which is there to this day. 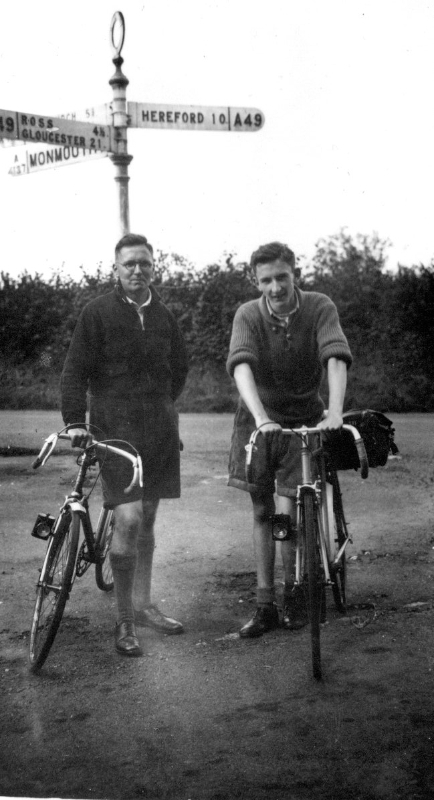 Of the three brothers Arthur was the keenest cyclist, riding his bikes well into his 80s. This small gallery shows both Arthur and his wife Kathleen on their cycles. An early 1937 photograph of Arthur is also in this gallery.